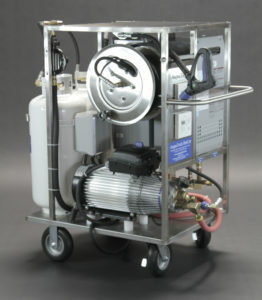 AaquaTools portable Deionization Cart “Model DI90CT” is perfect for small dealerships and private owners, the “DI90CT” make fast work of virtually all cleaning applications where water-spotting is an issue. Imagine totally eliminating the drying process when washing your automobile, aircraft, boat, or even windows. By eliminating “dissolved solids” or “hardness” from your water, you no longer have to deal with spotting when incorporating deionized water into your wash process. ICS’s “DI90CT” features a heavy-duty stainless steel cart with oversized semi-pneumatic locking casters for easy mobility wherever your cleaning application may be. An ever reliable 9 Honda OHV engine with oil alert, is the driver for the high-pressure system where a General Triplex Plunger Pump delivers the water at up to 2500 psi at nearly 4.0 gpm. 100’ of heavy-duty high-pressure hose mounted on a convenient hose reel attached to a swivel based trigger gun and wand, makes your cleaning process fast and easy.